PARIS (ESA PR) — When satellites reach the end of their working lives, they may pose a threat to other spacecraft as they continue to orbit in a dormant state for many decades. But now a new way to deorbit ageing satellites in a safe manner is nearing its first test in space. 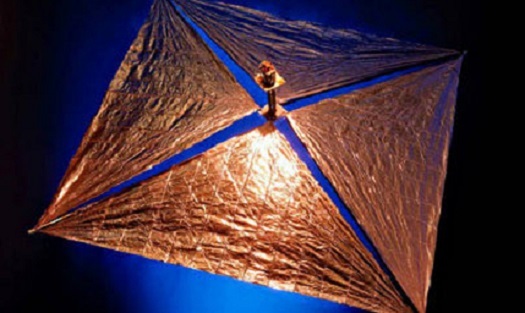 In the future, satellites might carry a packaged ultra-lightweight ‘gossamer sail’ to open as they head towards retirement. The increased aerodynamic drag would pull the craft out of orbit to burn up in the high atmosphere, reducing the risk of catastrophic collisions and creating a sustainable space environment for future generations. At launch, the Gossamer Deorbit Sail is extremely compact, occupying 15x15x25 cm and weighing only 2 kg. It would expand in minutes to 5×5 m – enough to bring down a satellite of up to 700 kg. A frame of extremely lightweight carbon-fibre booms supports a sail of aluminised Kapton only a few thousandths of a millimetre thick – a fraction of the diameter of human hair. 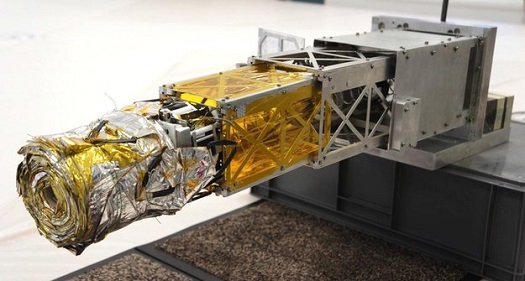 The sail was developed at the University of Surrey’s Space Centre, funded through ESA’s Advanced Research in Telecommunications Systems programme. It is primarily intended for satellites in low orbits, some 700 km up, such as those belonging to Iridium, Orbcomm and Globalstar, who provide satellite phone, low-speed data communications and messaging services. Under the European Code of Conduct for Space Debris Mitigation, created in 2008, ESA is committed to freeing up orbits within 25 years. However, a dormant satellite in 750 km altitude without such a sail could remain in orbit for a century or even longer like a speeding bullet endangering new satellites. In low orbits, there is still sufficient atmosphere to generate the needed drag thanks to the large sail size. Even with the sail, it could take up to 25 years for the satellite to reenter and disintegrate, but to deorbit in the same time frame using traditional thrusters would require ten times the equivalent mass in propellant. For satellites in higher orbits beyond the atmosphere, the sail could potentially use solar radiation pressure to descend with the help of an attitude control system – ‘solar sailing’. The gossamer sail has been subjected to rigorous testing, including thermal, vibration and vacuum tests. The team hopes to see it validated in orbit using a demonstration satellite by the end of 2014 on a piggy-back launch opportunity. Once in orbit, the sail will be deployed for testing. The initial tests taking 2-3 weeks will demonstrate solar sailing propulsion. After this, the sail will be rotated to increase the effect of atmospheric drag and so deorbit the satellite. At an altitude of 600 km, there is enough atmosphere to cause re-entry and burn up in a mere 2 to 12 months. The sail would ensure that decommissioned satellites could be retired well within the quarter-century deadline. It could also have other uses, such as deorbiting any adapter that is jettisoned in the course of launching multiple payloads. Professor Vaios Lappas from the University of Surrey commented: “We are delighted to have completed the design, manufacture and testing of ESA’s Gossamer Deorbit Sail, the first of its kind internationally.